The takeaway from this historic tasting is obvious: the Chianti Classico Riserva Vigna del Sorbo is Fontodi’s flagship wine. It’s as simple as that. Although Fontodi is best known for their 100% Sangiovese Flaccianello – one of Italy’s most revered and coveted wines – over the years it is the estate’s Chianti Classico Riserva Vigna del Sorbo that has built the more distinguished track record. Complete verticals of both wines over the last two years confirmed what has long been an intuition; Vigna del Sorbo is a more consistent performer than Flaccianello, ages better and is a much more finessed, pedigreed wine. Readers who aren’t familiar with Vigna del Sorbo owe it to themselves to check it out what is without question one of the great reds of Italy. Like so many nearby properties, Fontodi originally belonged to the church of San Leonino. Over the centuries, churches had acquired huge tracts of land, most of it donated in exchange for salvation. A first wave of reforms and privatizations of land started in the late 1700s, as the church began selling acreage to local landowners. The first known wines from the present-day Fontodi property date back to the late 1800s, when the Bordoni family sold wines under their own label, taking advantage of a boom in exports that lasted from the end of the 1800s to the First World War, when borders and trade shut down. The Bordonis sold the property in the late 1930s to the Borri family from Biella, a prosperous town in northern Italy famous for its textile industry. During this period, the estate fell into disrepair. Consulting oenologist Franco Bernabei was brought in around the same time, which is where Fontodi’s present day history begins. 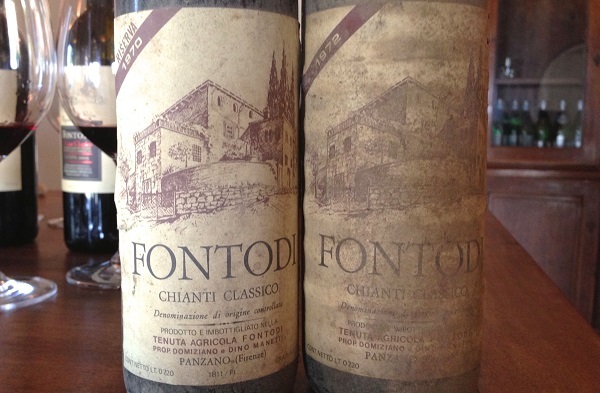 Under the leadership of Giovanni and Marco Manetti, Fontodi introduced their 100% Sangiovese Flaccianello in 1981. 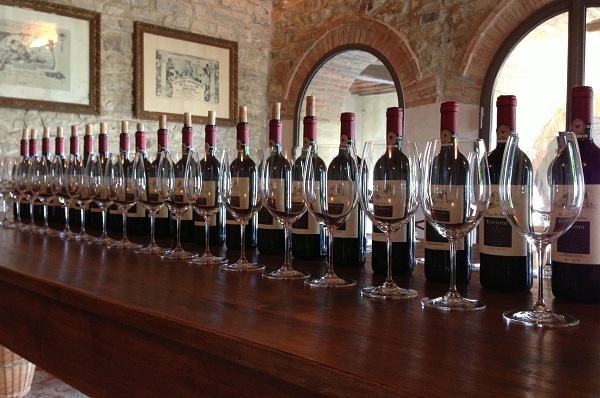 Flaccianello would go on to become one of the most famous and iconic wines in Tuscany. A complete Flaccianello vertical from 2012 is here. 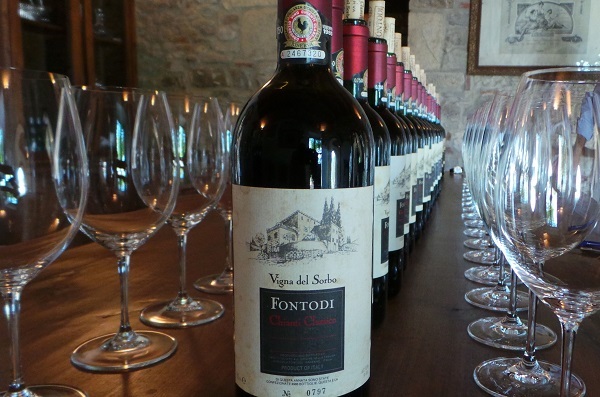 In 1985, Fontodi introduced their single-vineyard Chianti Classico Riserva Vigna del Sorbo. 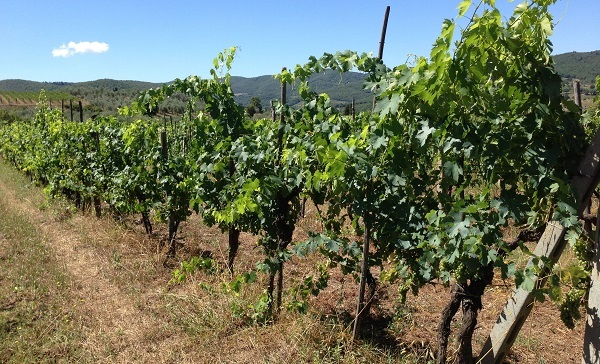 The vineyard itself consists of a number of parcels planted on galestro-rich soils, the main soil type present in the heart of Chianti Classico, The first and original parcel was part of the original purchase of the property. 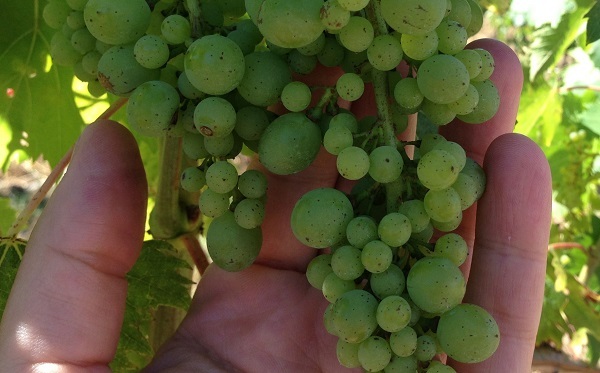 About 10% of the existing Canaiolo plants were grafted over with Cabernet Sauvignon, which has always been part of the blend. The clonal material came from the Contini Bonacossi family, owners of Capezzana in Carmignano, where Cabernet Sauvignon has a long history. Incidentally, the Alceo Di Napoli of Rampolla received his Cabernet Sauvignon material from the same source, which is believed to have originated at Château Lafite. The original Vigna del Sorob vineyard has since been replanted. A second parcel of 45 year-old vines was purchased about 6 years ago. It is a stunning site, with more uniform features than the original parcel and impressive views of Rampolla’s d’Alceo terraces. A number of smaller parcels are used for the estate’s straight Chianti Classico. Watch as proprietor Giovanni Manetti talks about the history of Vigna del Sorbo. The first vintages spent 18 months in barrel until 2001, when Manetti increased the time in oak to two full years. In recent years, toast levels have also come down. Today, Vigna del Sorbo is aged in a combination of untoasted, light toast and medium toast fine-grain French oak barrels. Blending takes place at the end of aging because Cabernet Sauvignon has a tendency to be more reductive than Sangiovese and therefore requires more frequent racking. Since 2009 Giovanni Manetti has reduced the Cabernet Sauvignon from about 10% of the blend to 5%, a reflection of how much character the Sangiovese has acquired as the vines have aged. Vigna del Sorbo has been made every year since 1985, with the exception of 1989, 1991, 1992, 1996 and 2005. The 2010 vintage is the first that will be sold under the new Gran Selezione designation. Readers who want to explore the best Tuscany has to offer will want to spend some time getting to know the Vigna del Sorbo. 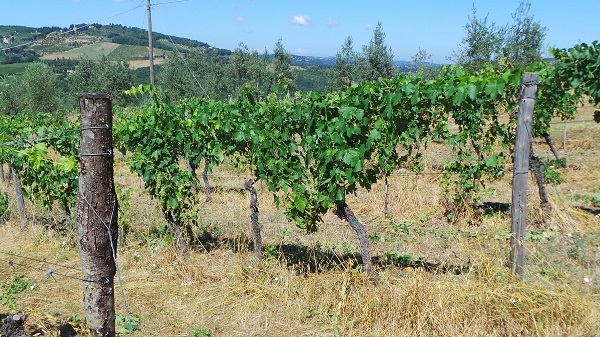 Flaccianello may get the most of the attention at Fontodi, but that just means that Vigna del Sorbo will remain an under the radar jewel for wine lovers around the world.